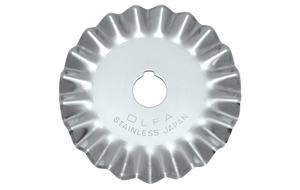 OLFA Rotary Cutter Deluxe RTY-2/DX Model 9654 is a 45mm rotary cutter that is perfect for all of your sewing and quilting needs. This cutter also cuts paper. The rolling razor blade is sharp enough to cut through more than 8 layers of fabric, making quick work of your strip, block, and pattern cutting. 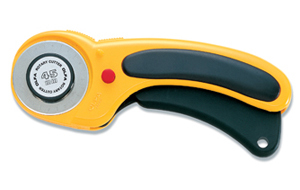 This rotary cutter features a unique comfortable handle design for both left and right handed use. Features include the dual-action safety lock that allows the blade to be locked open for comfort and closed for safety. Comes with 1 RB45 blade. 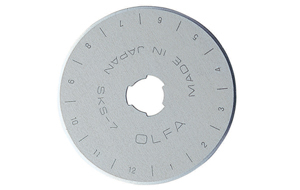 Uses replacement blades RB45, PIB45, WAB45 and SCB45. Perfect for cutting delicate cloth, fabric, paper, wallpaper, leather, etc. OLFA Handles Are Guaranteed Forever.